If my daughter had been born many decades earlier than she was, I have no doubt she would have been a suffragette. Would have marched down the street shoulder to shoulder with Susan B. Anthony and Elizabeth Stanton. 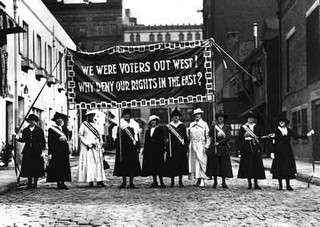 Instead, she arrived in an era when women have the luxury of taking their right to vote for granted. 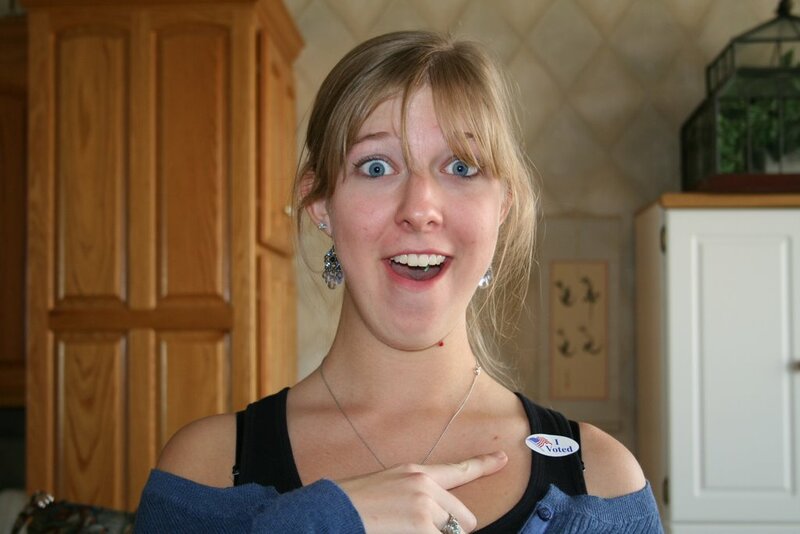 Jessica turned 18 a couple of months ago, and one of the first things she did as a legal adult was register to vote. We had talked about the candidates (beyond how annoying the campaign ads were) and where they stood on the issues. She had expressed dismay at how boring politics can be. I explained that politics is not the same as "the issues." The day to day realities of your life, your family, your community, your country . . . the world. Things that you don't have to worry about when you are eighteen years old and your future is so bright you have to wear shades. My children grew up in a world without war and mostly without fear. There were no duck and cover drills, no looming communist threats, no cold war, no Viet Nam, not even a Berlin Wall. Unfortunately, their children will likely be raised on a planet that is scarier than the one on which they were raised. So I am happy that my daughter is taking an interest in the direction our society will go, despite the boringness (and boorishness) of it all. I believe that, if she has children one day, she will appreciate the fact that she does have a say in how the world turns out. After we voted, I asked one of the volunteers if she had a sticker. She said she had run out, but I could have hers, and she pulled it off her sweater and handed it to me. I stuck it to my daughter's jacket and said, "It's her first time. I'm so proud!" Thanks, Susan. Congradulations Jessica: Maney people have struggled and died so we could become the nation that most of tshe world wants to sneak into. I am watching how people get elected without being bought in Arizona. It could be an improvement. Again congradulations and become an informed voter. Oh my gosh---Jessica has turned into an absolutely BEAUTIFUL young lady!!!!! And nice, too. How lucky can you be? No--that's not luck---it's called good parenting!!! Anyway--it sure was fun to read and see your blog! Look'it here - pictures! Wow, it's been so long since I last saw that little blonde girl next door. I NEVER would have recognized her on the street today. Congrats Jessica - and welcome to adulthood. Now you get to help be responsible for future of our country too. Obviously, we can use all the help we can get! Hey, I just put my glasses on and Jessica is beautiful!!! Perhaps I should have had glasses on when I typed the previous remarks. I do spell phonetically you know. bill - Thanks. Elected without being bought? What an interesting concept . . .
jeff - I know, huh. I wouldn't have recognized your kids, either! They have a tendency to grow up when we aren't looking. That little blonde girl is out riding her crotch rocket. Good grief. Go Momma! And I applaud your daughter! momma - Thanks! Pretty fun watching your kids do cool stuff. tracyh - Yeah, it seems eons ago our girls were on the same softball team. They seemed so little then. I remember the first time I voted...it was pretty cool. And I still wear the sticker. All day. My first reading of a Blogg--I had perceived "Blog" as being something pulled from a slimy pond. Your hubby sent me the link and I thank him for that. GREAT WRITINGS Linda--you really have a talent for marking up paper. How do I know when the next is accessible? heather - I actually save the sticker on a bulletin board or the fridge (when they don't run out). I need help. dad k - Hopefully I won't write anything resembling a creature from a slimy pond! I write when the muse strikes, which is usually every two or three days. Thanks for the compliments, glad you stopped by! An after thought re. Halloween. Last year three nicely costumed young girls, probably 12 yrs old or so, came to our door and said "trick or treat". I hesitated with a basket of candy and asked "What tricks do you administer if there is no treat?" They looked at each other in amazement and one finally said she could wiggle her ears! I gave them all extra helpings and sadly reflected on my long past youth. Way to go, Jessica. You've got a great mom. I live in Florida where EVERYBODY will tell you that EVERY vote counts. Unless it's a hanging chad. dad k - Kids don't know what tricks are anymore. When we lived in Pond Creek, Jess would invite her Enid friends and they would raise Cain, along with the rest of the kids. The city didn't mind them doing it, as long as they cleaned it up the next day. wendy - Yeah, it's hard to count when you're a hanging chad. I think I actually voted in a "machine" once in my life. I wonder if the votes were correctly counted. How will we know? Remember Hal from 2001? Just asking. The Republicans lost and they forgot to call it fraud. They did not learn anything from the Democrats! That goes way back to Chicago, when Mayor Daley always had all the city dead voting.